A St. Louis Original: Ooey-Gooey Butter Cake. A few weeks back, I was watching Martha Stewart Bakes during which she made something I had never heard of in my forty-plus years as a chef–a Gooey Butter Cake. It seems this cake was invented during the Great Depression in the 1930s by a German-style bakery located on the St. Louis South Side. And like a number of foods we enjoy today, the gooey butter cake came about quite by accident. While making a batch of standard coffee cake, the baker transposed the ratio of flour to butter, or maybe it was butter to sugar, but whichever it was resulted in a gooey, sticky mess. And times dictated the bakery try to sell the resulting mistake rather than let the product go to waste. Oddly enough the new cake sold so well that the bakery continued making them. Soon other St. Louis bakers began producing their own versions of gooey butter cake, and what began as one baker’s accident became area icon. As with most new foods that become popular, multiple claims of its origin begin to appear. The gooey butter cake is no exception. Two groups in particular lay claim to this iconic dish: the Danzer family and the Koppe family. According to Richard Danzer, one Saturday morning in late 1942 or early 1943, St. Louis baker Johnny Hoffman messed up one of his recipes. Upon discovering the results were surprisingly tasty, he called his friend and fellow baker Herman Danzer, Richard’s father, and told him what had happened. The two bakers spent the rest of the day at Danzer’s shop trying to recreate Hoffman’s blunder. Just as they were finishing their final and successful effort, Melba Danzer came in to see what the two friends were up to. Upon tasting their creation, she exclaimed “this sure is gooey” and thus the name. Herman Danzer died in 1997. Unfortunately, neither his son, Richard, nor his wife, Melba, had retained any of his recipes and therefore have no way of proving the accuracy of the story. And then there is the Koppe side of the story as told by the daughter of Master Baker John Koppe who owned a bakery throughout the 1940s during WWII. It was during these years that John was to have developed the gooey butter cake. Following the war, Koppe sold his business and went to work for St. Louis Pastry Shop, giving them his recipe for this classic St. Louis specialty. Again, there is no concrete evidence that shows John Koppe to be gooey butter cake’s inventor. Also, I find it intriguing that he gave his recipe to the same bakery owned by Johnny Hoffman. If these two claims were not confusing enough, there is the distinct possibility that this St. Louis treat was actually created in Philadelphia. It seems that the Philadelphia Butter Cakes have been sold by the area’s German bakeries since the 1930s, although I find nothing to suggest that any particular bakery there makes claim to its origin. There are two things upon which everyone seems to agree. The original gooey butter cake had a sweet yeast dough base with a topping made from corn syrup, sugar, vanilla, and of course butter. It was certainly not the modern version made today by some using cake mix base with a cream cheese topping. And while gooey butter cake is a type of coffee cake rather than a dessert cake, it can definitely be eaten at any time of the day. Today you can find the gooey butter cake in bakeries all over the St. Louis area. There are also versions available nationwide, including a variety called the Paula Deen Baked Goods Original Gooey Butter Cake sold in Walmart stores throughout the country. Another bakery, Ann & Allen Baking Company, sells a whopping 76 varieties of gooey butter cake marketed online in all 50 states. The company’s original version even won top prize in Food Network’s Food Feuds. There seems to be a revival today of classic Americana sweets, and the gooey butter cake is just one example. I’ve added instructions for both the original and modern versions of this delicious yet unusual treat to the Recipe Index of this website for your convenience. I hope you’ll try baking one soon, and let your family find out what folks in St. Louis have known for more than eighty years–regardless of who the originator was, the Ooey-Gooey Butter Cake is one mistake worth making. The first baked goods I ever mastered was cornbread, that iconic quick bread so loved by just about everyone in American, especially in the South. Cornbread was a dinner staple in my home growing up, and I suppose that’s why my mother was so adamant about me learning to make it. It may have also had something to do with cornbread being my favorite snack at the time, and therefore I was always requesting her to make it. Shortly after my tenth birthday, I received my first lesson in the art of making cornbread–one I remember to this day. “Get that large green mixing bowl and put in one and a little more than half a cup of cornmeal. No, no, that’s too much . . . that’s better. Now add about a quarter teaspoon of baking soda and a slightly heaping teaspoon of baking powder. Okay, add half a teaspoon of salt, and stir everything together. Then she had me sprinkle some cornmeal into the melted grease left in her cast iron skillet. Only after the meal was nicely browned was I allowed to add the batter and place the skillet in the oven. After about 20 or 25 minutes it was done–tender and fluffy on the inside with a crisp, deep mahogany crust on the outside. It was this crust that my father loved to cut off, slather with gobs of “butter” (actually margarine because it was cheaper), and eat with his supper. Sometimes he’d drown a large piece of buttered cornbread with molasses and eat it for dessert. I, not being a huge fan of molasses, enjoyed another of my father’s cornbread rituals–crumbling it into a bowl, pouring ice cold buttermilk over it, and eating it like cereal. Man, it just doesn’t get much better than that! Many people credit the rural South for creating cornbread when in reality we can thank the Native Americans for its humble beginning. By the end of the thirteenth century, the cultivation of corn had spread throughout the middle and eastern parts of America and as far north as southeastern Canada. Corn was a major food staple for the Native Americans, who were roasting it, grinding it into meal, and turning it into all kinds of cakes, breads, and porridges long before the first European set foot on our shores. As the local Indians introduced early colonists to corn, they also showed them numerous ways of using it, including making a bread called “pone” (or sometimes referred to as “Indian pone”) made of cornmeal (Indian meal), salt, and water. This was the first cornbread. 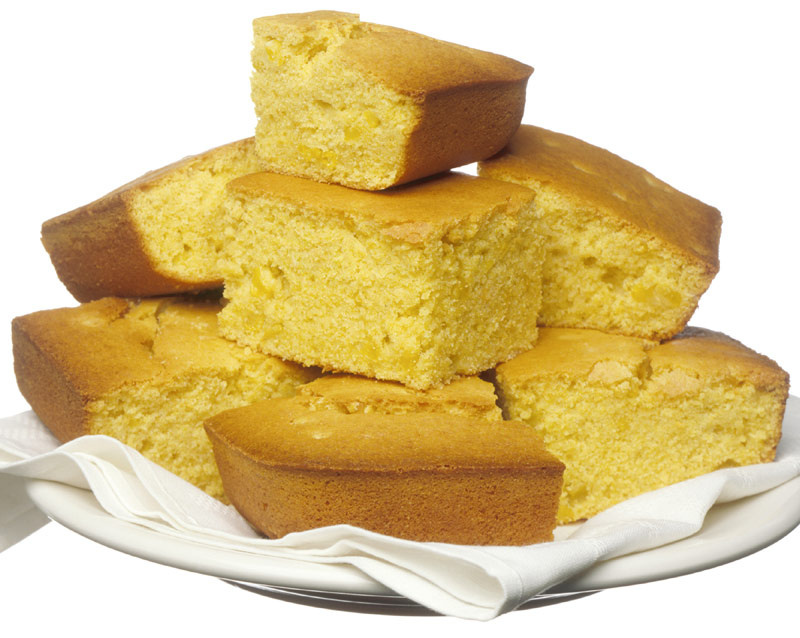 Soon colonists begin developing their own recipes for “cornbread,” referring to them by any number of names–ashcakes, hoecakes, journey cakes, johnnycake, and dodgers, to mention a few. These names varied by region and community, as did the differentiation in recipes. One reason cornbread has always been so popular is that flour and yeast–commodities that were once expensive and hard to get–are not needed. Another is that making cornbread is quick because it does not need to rise, as do yeast breads. Cornbread was the bread of life for America’s rural poor and working class. 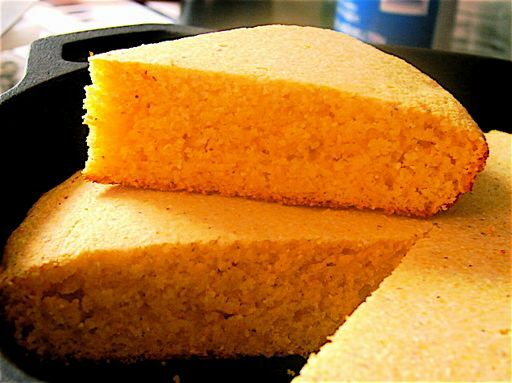 Today cornbread is enjoyed by everyone throughout the United States, with as many recipes as there are people who make it, although the basic ingredients–cornmeal, eggs, oil, and milk–remain the same. This is particularly true in the South and Southwest where it has become a traditional staple with many uses, from a side dish for barbecue, chili, and various legumes (such as pinto beans, butter beans, and blackeyed peas), to stuffing for chicken, turkey, and pork. Northern and Southern cornbread differ in several ways, from the preference in types of cornmeal used (yellow cornmeal in the North; white in the South), to the amount of eggs and sugar in the recipe. Northerners typically use a 1:1 ratio of cornmeal and flour, making the finished product lighter with a more cake-like consistency. Southerners tend to use little if any flour. 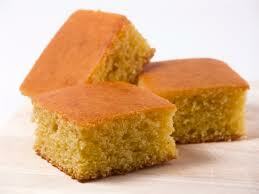 And contrary to the beliefs of many, sweet cornbread is not limited to people in the North. Actually, the practice of adding sugar began in the South, although tastes in this region seem to run more to the savory side. Southerner’s also tend to favor buttermilk in the batter as well as the use of flavorings such as corn kernels, chilies, cracklings, or green onions. And finally, it is traditional in the South to bake cornbread in a cast iron skillet using hot bacon grease to give it a distinctly crunchy crust, whereas Northerners prefer vegetable oil and square metal or glass baking dishes. Having grown up in the South and Southwest, I tend to be partial to sugarless cornbread, although I do prefer yellow course ground cornmeal. 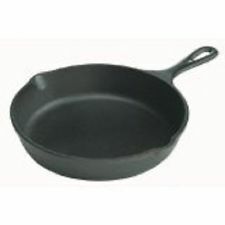 Today “Sugar’s” black cast iron skillet hangs in my kitchen, having been a gift from her in the mid-1990’s shortly before she passed on to her heavenly home. And although I do own a set of measuring cups and spoons, I continue to measure the ingredients for her cornbread recipe using a tea cup and a teaspoon from my stainless flatware set.